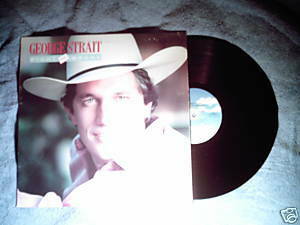 MCA 134659 George Strait Right or Wrong 1983 LP includes title track, You Look So Good in Love, A Little Heaven's Rubbing Off On Me, Let's Fall to Pieces Together, Every Time It Rains (Lord Don't it Pour). Bob Moore an bass; Hargus "Pig" Robbins on keyboards; Johnny Gimble on fiddle and electric mandolin. Produced by Ray Baker. Vinyl is VG/VG; cover with photo is VG with minor ring and seam wear.